Builder’s realize that the new home building process is exciting! Clients want to feel a part of the construction process and what better way than to be on-site looking around, right?! Well, not exactly, here are a few thoughts from a different perspective. At many and most stages through the building process, your home site is not the safest environment. It is a construction zone. That means loose lumber, nails, no railings, and Trades working in the home on different areas concurrently. The Trades aren’t suspecting homeowners or anyone to be coming through their area of the home so when they throw siding, or shingles off the roof, they don’t think anyone will get hurt. Unfortunately, there have been many cases of injury and sadly even deaths in Alberta because of events like this. Site safety is something Builders take seriously to protect their Trades, clients and themselves. When your Builder requests you stay off-site, now you can understand a little more of their side of things. But, I want to see it! Your Builder will usually have a scheduled walk-throughs set up throughout the build so that you can have a look at the progress of your home. These scheduled times allow your Site Superintendent to notify Trades that you’re coming through as well as tidy up some of the disarrays that happen through the build process. For these walkthroughs, closed toe shoes and hard hats are expected to be worn. Depending on your desire to walk through the home and your builder, you can make a request for additional walkthroughs. Keep in mind, more walkthroughs mean more disruption to the Trades building your home and a longer build time. Therefore, even though more walkthroughs may sound appealing, a quicker, disruption-free schedule allows your home to be built more timely and smoothly. Something to consider when discussing your walkthrough schedule with your Builder. Another option is to request weekly or monthly photos of the home progress, so you can get a sneak peek without disrupting the schedule and putting yourself at risk. In a typical build, about many things go wrong daily or even hourly, and your Site Superintendent/Builder/General Contractor is constantly working through these problems. This is their job, that’s why you hired them. They have certain points of Quality Control to make sure the home is being built to their standards, built to the home plan and built to the agreed upon specifications. There should be some inherent trust with your Builder, but what sometimes happens is a homeowner goes into their home and sees things that aren’t quite how they should be. 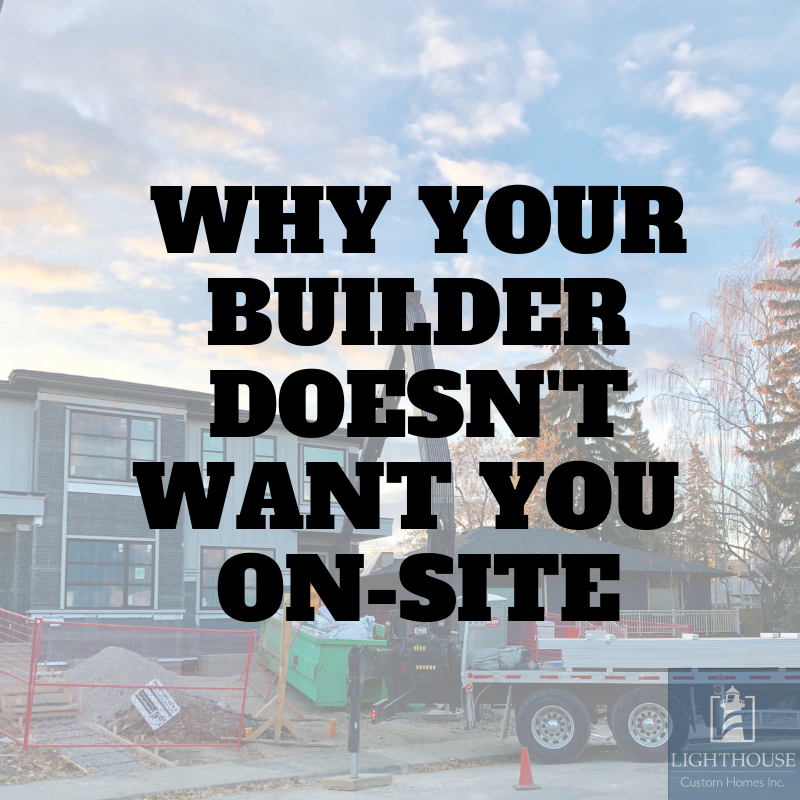 They talk to Trades, or their Builder and feel they are saving everyone a lot of headache by being on-site more often to “catch” these mistakes. If you have a great Site Superintendent (you can determine this by interviewing former clients that have had the same person), then you’re in good hands. Your list of 3 things that you “caught” for your Builder was likely already on their list of 67 things that they noticed. Most Site Supers are on-site every day to check for mistakes. They aren’t called “Supers” for nothing! If you are genuinely concerned about the quality control going on in your home, it would be worth sitting down with your Builder to discuss. Lighthouse welcomes our clients on-site at their scheduled walkthroughs and is always happy to coordinate a few extra at our client’s request. If you would like to interview some of our previous clients, we are always happy to connect you.